Mr. Angel Gurría, Secretary-General of the OECD, was in Antalya from 12 to 16 November 2015 to attend the G20 Leaders Summit, deliver on the G20/OECD BEPS Action Plan and a number of other areas including inclusive growth, youth employment, quality jobs, skills, investment, development, green finance and anti-corruption. The Secretary-General participated in the different working sessions and delivered specific interventions on several topics including taxation, trade and inclusive growth. While in Antalya, Mr. Gurría also delivered opening remarks at the G20/OECD/UNDP International Conference on Open Data and participated at the B20, the T20 and L20 Summits, gathering leading thinkers, business and union representatives. He held bilateral meetings with several of the leaders and high-level authorities present. 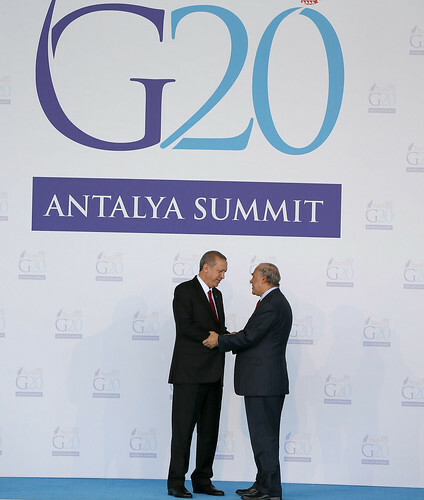 President of Turkey Recep Tayyip Erdoğan and OECD Secretary-General Angel Gurría at the G20 Summit in Antalya, Turkey.